You might have seen us going a little crazy over Age of Sigmar: Champions recently. It’s been out for a little while now and it seems to be causing quite the splash with online retailers struggling to keep hold of stock for long. Whilst everyone is still becoming accustomed to the game, I thought I’d give you the rundown on a few handy things to remember. I’ve played plenty of games with various opponents and have compiled a list of things you should absolutely remember! Whether you simply forget them or don’t know they exist, find some key rules below. Completing the quests of your champions will allow you to unlock the Blessings in their lane. Unless victory is one card away, you should try to attain these Blessings at all costs. Whether it’s the safe and respectable Chaos Runeblade or the outright terrifying Supernatural Horror, get those quests done! So whichever champions you decide to take, be sure to consider their quest criteria when deck-building. Do you have enough ability cards to complete these quest segments? What about removal cards? Help make attaining victory easier and consider your quests when deck-building in Age of Sigmar: Champions. Stacking is a particularly powerful card type that is seen more often in the Destruction grand alliance. You’ll likely have a healthy amount of Stacking cards but try to pick the right time to use them! For instance, say you’ve got some Stacking Grot cards in your hand that you want to put down for a quest. 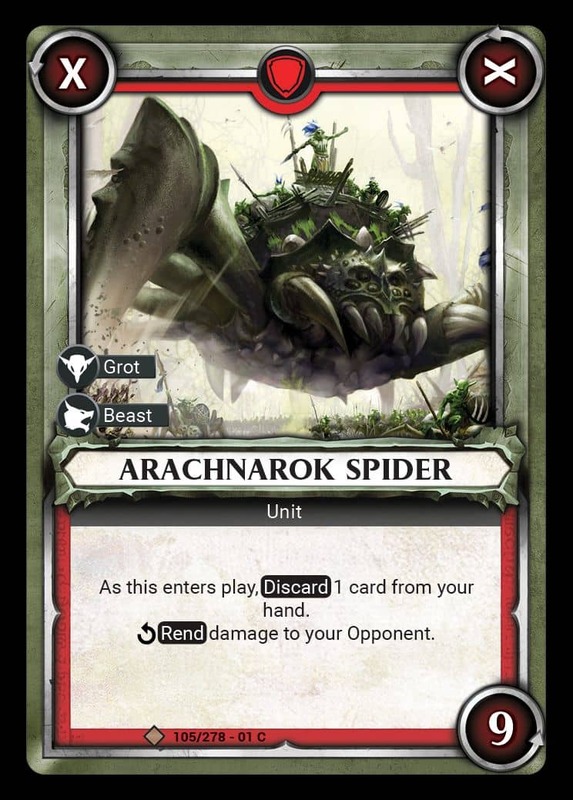 Let’s you’ve got an Arachnarok Spider in play which will deal a fistful of damage on its last turn. Consider holding on to those Grots until the Spider has turned to its last corner and dealt its damage. Try to think a few turns ahead in scenarios like these. In this situation, if the stars align, you’re doing 6 damage from the spider then with two Stacking Grot cards, you’ll deal a potential further 3 damage. There are a handful of cards in the game with the Rotate keyword. Some cards say to Rotate highlighted cards to their final corner. This would be great on a Spell like Arcane Bolt, getting the damage out faster before it can be removed by your opponent. However, something I’ve seen overlooked is that each corner that is passed also triggers. This could be a colossal blow to your opponent when used alongside the right card like Pack of Bloodletters. Consider this carefully when looking to Rotate cards as you’ll be cashing in on a card completely. Every. Single. Corner! This is something I’m particularly guilty of when playing Age of Sigmar: Champions. Don’t forget that many champions offer abilities, damage buffs, even Heroic Acts! The Loud-Mouthed Megaboss, for example, can Rotate a Unit in its lane two steps forward. This means you put down the aforementioned Arachnarok Spider, trigger the Megaboss’ Heroic Act and the spider has instantly paid off! Some abilities on champions are more potent than others, but just remember that you have them. They could make all the difference. Also, can you tell I love the Arachnarok Spider, yet? Yet another point I’ve seen cause some contention is the meaning of “X” in the corners of cards. When an X corner is active, some people assume the card effects still trigger, the value of the corner is simply 0. This is importantly incorrect! Should the top left corner of an active card be X that means the card does nothing. No effect, no damage, no nothing! Should the corner have 0 instead of X then it can be activated/triggered. The important thing to remember is the X means that the card does not do anything at all whilst it is in the top left corner. Don’t let anyone tell you otherwise! 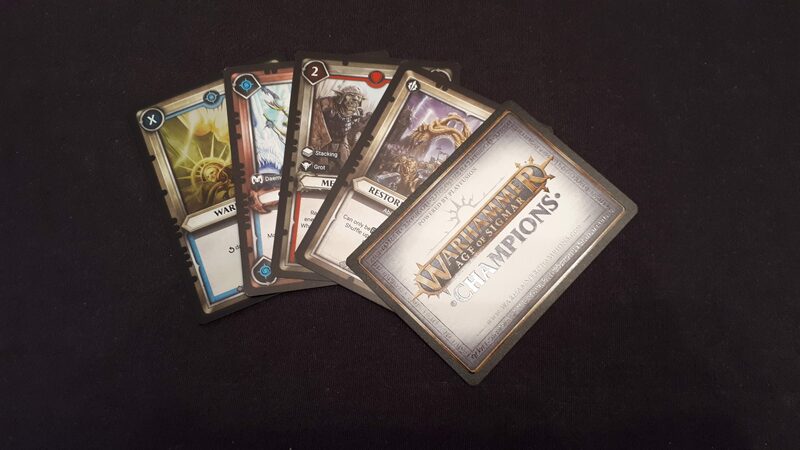 You may have missed this, but the online card database for Champions is live right now! You can see every card currently available within the game. It’s a good opportunity to study cards you may not own or use yourself. Knowing the cards is half the battle, make the fight a little easier on yourself and get researching! We’ll likely be covering Age of Sigmar: Champions more over the coming weeks, but we’d love to see what you guys think of the game. What decks are working for you? What cards are absolute must-haves? Let us know and don’t forget to stop by our Facebook page. Does it effectively work like a Sorcery in Magic? I realize the games have nothing in common, but to understand how the card works… When my Wizard casts it, it gets placed in the slot above him and does its 3 damage then disappears? Or does it stay in the slot and only clear out once the next turn begins and cards are rotated? Any help would be appreciated, thank you! Look8ng forward to this game. Upon playing it onto your Wizard it will do 3 damage to your opponent (as it is 3 damage inflicted via value at the top left corner and the effect triggered when placed when placed). It will also reduce damage 2 by against the lanes highlighted on the card whilst it is in play. On your next turn you rotate this card counter-clockwise (along with any other cards on the action row). As this rotation leaves the top-left corner without a number or “X” in it, the card is exhausted and thus discarded. I believe the AoS Champions YouTube channel has a handful of handy tutorials if you might want more information. Nice!! Thank you so much. That confirms my thoughts .I appreciate the suggestion, too.